With carbon pricing policies emerging around the world and the recent show of public support for carbon pricing from 74 national governments and more than 1,000 businesses, one piece of the puzzle that needs to be solved is how to connect systems to create an international carbon pricing framework. 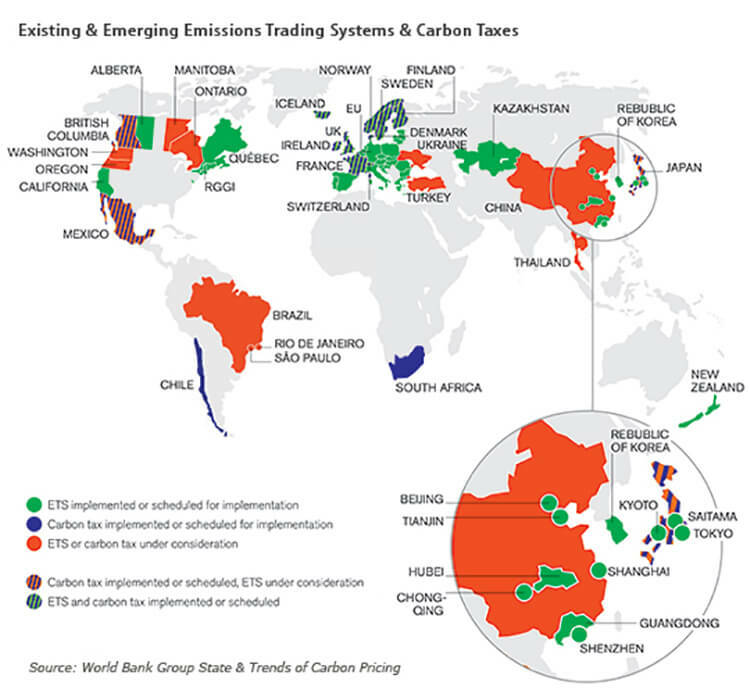 In the lead up to the Paris negotiations this December, governments from around the world – including China, South Africa and Russia – have signaled their willingness to apply a price on carbon, yet businesses and civil society know that we will not be able to move towards a fully functional low-carbon global economy by operating under a fragmented system of international carbon pricing policies. Furthermore, the IPCC’s verdict on the need to increase international cooperation on climate mitigation policies highlights the need for an international carbon pricing framework. The need to act is now, but how can we do it? Most thought leadership on this idea stems from efforts to connect carbon markets. This is not a new idea; after all, the Kyoto Protocol was, in effect, a linked carbon market as it allowed for emission reduction credits to transfer across international borders. With action on carbon pricing now emerging at the national and sub-national levels, it’s important to note that there have only been two policy “links” to date between two different carbon markets. Several years ago, Norway joined the EU’s emission trading system, while another link was established just last year between the state of California and the province of Québec. The attraction to connecting carbon markets and pricing system is understandable. A reportby the Harvard Project on Climate Agreements, commissioned by IETA and released ahead of the Lima climate talks late last year, set out the advantages of policy linkage, including the potential to seek even more ambitious emissions reduction goals, lower compliance costs with such policies, reduced price volatility and the opportunity for concerned governments to demonstrate international leadership on climate change. The paper highlighted that the IPCC encourages such cooperation and that connectivity could easily happen outside of the international climate negotiations and the UN process. Many readers of this paper have commented that the secret ingredient is political will. Forging political and economic compromises to harmonize different carbon pricing systems so that they are able to link is not easy. The California and Québec example took several years before the two were fully integrated, but it did show that when two governments see the economic and climate benefits of pooling their respective carbon pricing systems, it’s difficult to continue acting alone. One alternative to connecting systems through linking is “networking”. Instead of harmonizing systems, networking involves facilitating cross-border trade of carbon assets by developing the services and institutions needed to acknowledge differences across carbon pricing systems and placing a value on these differences. In the current absence of an overarching international carbon pricing framework, the process of jurisdictions coming together to discuss the form and scope of connectivity, whether through linking or networking, may bring benefits in itself. For example, this kind of bilateral cooperation may help all actors – governments, corporates and civil society – to better understand the different systems, thereby facilitating comparability. The topic of “comparability” is the focus of a new scope of work to be prepared by IETA, the Harvard Project on Climate Agreements and the World Bank Group. An international carbon pricing framework would need a system that would allow for transferring emission reduction credits along with a set of standard components for accounting, an emissions registry and provisions on environmental integrity. IETA and its members carefully thought through the type of architecture an international carbon pricing framework would need and proposed some of these provisions in a straw proposal last year. We believe that either the UNFCCC process or bilateral arrangements (eg, several countries coming together and linking) could deliver such architecture. This system would allow all carbon pricing approaches to be connected, both market-based and non-market based. It could also help identify opportunities for low-carbon abatement around the world that might otherwise be missed in the absence of such a framework. Time is running out, yet a 2°C goal is still within reach as long as political will on climate change remains strong. Efforts to put a price on carbon are building momentum, and an international carbon pricing framework could further help build the confidence needed to show the business community and civil society that we are on our way to a resilient low-carbon future.